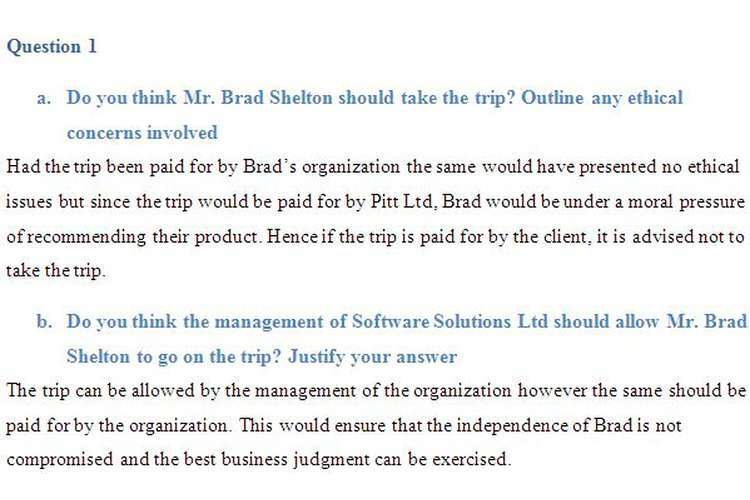 Had the trip been paid for by Brad’s organization the same would have presented no ethical issues but since the trip would be paid for by Pitt Ltd, Brad would be under a moral pressure of recommending their product. Hence if the trip is paid for by the client, it is advised not to take the trip. The trip can be allowed by the management of the organizational concepts however the same should be paid for by the organization. This would ensure that the independence of Brad is not compromised and the best business judgment can be exercised. C. Do you think that Software Solutions Ltd should have a code of conduct? What would be the advantages and disadvantages to Software Solutions Ltd of having a code of conduct? A. What is meant by Greencross Ltd 'consolidated' Profit or loss (income) statement? B. The key statistical data is provided at the bottom of the income statement. For each item, summarise the change occurring between 2015 and 2016 and what this means for Greencross Ltd. The gross profit position of the organization has improved over the years which imply an increase in revenue and reduction in costs (ASX, 2016). This implies that the operating expense of the organization has reduced. This has improved the efficiency of the concern. The revenue of the organization has grown in the current year however the same has been lower than the % increase in the year 2015. The net profit after tax of the organization has improved for the previous two years as in 2014 the organization had recorded a negative net profit or on other words loss. This implies that the financial performance of the organization is improving. The level of debt of the organization has increased which implies that the concern is becoming more leveraged. The long term assets of the organization have increased as compared to the previous year. An increase in the number of stores year on year implies that the organization has been increasing its presence and affiliates (Greencross Limited, 2016). An increase in cash flow from operations implies that the efficiency of cash collection has improved which has also strengthened the overall cash position of the organization. C. What is the purpose of providing two years of comparative figures for the financial statements (i.e. 2015 and 2016)? How would this information be useful to one of GreencrossLtd's shareholders? Comparative figures of the organization provide the user with a year on year analysis and enable them to understand if the performance of the concern has undergone a change in respect to the previous year or not. This helps to financial management of change that has taken place. Providing comparative figures also enable to compare organizations of varied sizes. Code of conduct. (2010) (1st ed.). [Darwin]. Greencross Limited,. (2016). Greencross Limited Investor Downloads. Greencrosslimited.com.au. Retrieved 25 November 2016, from http://www.greencrosslimited.com.au/Investor-Relations/Downloads.aspx. Smith, K. (1999). Code of conduct (1st ed.). New York: Avon Eos Books.